Fuel cells are strongly linked to renewable energies, particularly to the so-called “Hydrogen Economy”. For decades the development of fuel cells able to convert hydrogen and oxygen in electrical energy with water as unique byproduct has motivated huge activity in fundamental and applied electrochemistry. In this chapter we introduce the concept of methanol economy and discuss its status and perspectives. 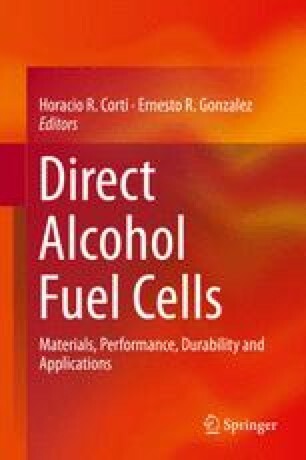 To be a reality the methanol and other alcohol economies depend on the development of alcohol feed fuel cells, whose components, operation modes and general performance are analyzed.